SOCHI -- Slovenia had little interest in playing the polite guest for Russia's coming-out party at the 2014 Sochi Olympics. In a fortuitous coincidence, the Russian hockey team opened its first Olympic campaign on home soil before an adoring, sellout crowd at Bolshoy Arena against a country making its Olympic debut in the sport. It was a recipe for a celebration for the ages. 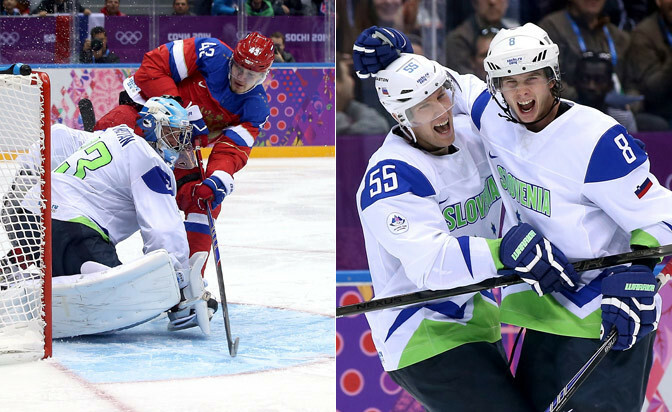 Except Slovenia, a collection of relative unknowns built around NHL star Anze Kopitar and coached by Kopitar's father, Matjaz, decided that it did not want its first Olympic experience to be remembered for serving as cannon fodder. Russia jumped to a two-goal lead less than four minutes in on goals by NHL superstars Alex Ovechkin and Evgeni Malkin, and the party was at full throttle in the Bolshoy. But then the Slovenians remembered why they were here and how hard the journey to these first Olympics had been. "We know we are not here for the medals, we are here to represent our country and the hockey and I think we did that well [Thursday] and we are going to go from here," said Slovenian forward Ziga Jeglic, who scored both his country's goals in a 5-2 loss in the opening Group A preliminary-round game for both teams. "It was a little bit of a slow start but we can definitely be proud of this one," said center Anze Kopitar of the Los Angeles Kings, the Slovenians' lone NHL player. Russia needed a two-goal outburst in the third period to pull away from a country expected to be the tiniest minnow in this two-week clash of hockey titans. Until then, Russian forward Pavel Datsyuk admitted there was much "tension" among the Russian players. After all, clinging to a 3-2 lead heading into the third period was not expected of a team many in Russia believe will be a disappointment if its fate involves anything less than gold. "Nobody expected that," Slovenian goaltender Robert Kristan said. "From what I heard the Russians didn't even talk about us. But that is kind of understandable because nobody knows us; but we showed [Thursday] a lot of good things." The Slovenians certainly did that, starting with their hyperactive goalie. Kristan, 30, has toiled throughout Europe since 2000, playing in his home country as well as outposts in the Austrian and Swedish leagues. He currently plays for Slovakian team HK Nitra. Yet after being strafed for two quick goals, Kristan turned into a virtually impenetrable wall for the next 40 minutes, throwing a scare into perhaps the most explosive team in the tournament. "I knew it was going to be tough, I knew there was going to be a lot of skating in the crease," Kristan said. "I just tried to see the puck all the time and I was doing well. But it's tough; it's tough. I expected that and a couple of times I was lucky." Just as often he was good. Ovechkin and Ilya Kovalchuk, who scored the game-winner on the power play, launched shots that would befuddle most NHL goalies. Valeri Nichushkin scored on a power rush that left the Slovenian defense in his wake, and Anton Belov finished the scoring with a slapper from the point. Belov's goal is the only one Kristan might want back. "Since I've come to play for the national team since I was 17 years old, he's played like that," said Anze Kopitar, now 26. "He is an outstanding goalie and he deserves a lot of credit." So does Jeglic, who burst into the hockey consciousness with an unexpected performance. Less than two minutes into the second period, he beat Russian goalie Semyon Varlamov with a superlative effort to make it 2-1. After Kovalchuk scored on the power play, while Jeglic was serving a penalty for an offensive-zone trip, he made amends by scoring another beautiful goal to make it 3-2. The initial goal was his country's first in Olympic play, earning the 25-year-old a spot in the record book that will never be erased. "It was great scoring the first goal in history of Olympics for Slovenia, especially against Russia, the top team in the world," said Jeglic, who has split time between the Finnish and German leagues this season while battling a string of injuries. "It was a great game for us and for me especially, scoring two goals." In the end, it was a great game for the Slovenians, who achieved their goal of representing their country and the game of hockey well, even if they were uncooperative party guests. "Too bad we didn't surprise them," Jeglic said with a smile as he turned and headed for the dressing room.